john4jack (Corvallis, Oregon, United States) on 3 January 2010 in Cityscape & Urban and Portfolio. The flags were really popping in the breeze. This ends the Willamette River series. PHOTOSHOP - yesterday I mentioned the steep learning curve of Photoshop. These days I use PS primarily as a host for 3rd part plug-ins. U haz paddlewheels over there? @Glenn: Yep, but it sure ain't the Mississippi. ces jolis bateaux à roue me font penser au fleuve Mississipi. Très jolie photo urbaine Jack ! Great waterfront scene with the city skyline. The old paddle boat looks interesting. Is it a dinner boat while going for rides down the river? Excellent clarity. Nice series. @Barbara: Thanks, Barb. I forgot to ask my son about the paddle boat. I like the colors and the intricate details in this image. Good morning Jack! In all your pictures I see that you get a wonderful issue! Light and color perfect and very well worked. Your years of practice with the PS has been frankly magnificent good! Your photo today is notable for its composition as usual (good look at yours). It's downright beautiful and grand as your country! Besos teacher and good Sunday! @Fonts: Kisses from you makes my day! It's a great picture, I love the light here ! @Peggy M.: Thank you, dear Peggy. Sharp and striking lovely photo Jack! Crisp and beautifully shot ... this is my favorite of the series, which I've enjoyed, Jack! @Judy: Thanks. I almost didn't include this one; I'm a sucker for the bridges. This is a lovely shot..it actually looks a lot like the good old Thames in London (except for the US flag!). I guess big rivers in cities everywhere look much the same. Great capture. Pretty breezy on this side of the continent too. That's a great looking paddle wheeler! I haven't been to Portland in so long I probably would be lost downtown. 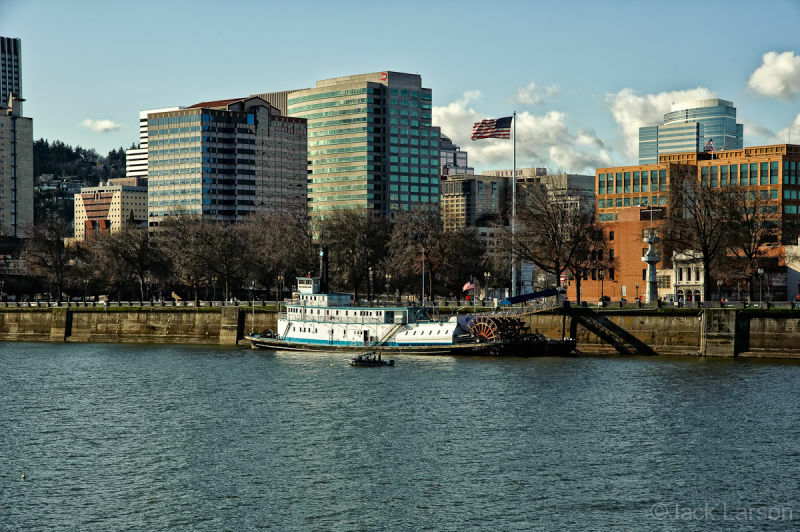 Fine cityscape with the Willamette as a base. Fine shot. What a "majestic" looking shot...Wonderful color and clarity!! @MARIANA: Thanks, Mariana. I value blur when it is selective focus that is well done. But I'm not attracted to photographs that are consistently blurry throughout. It's an attempt to be mystical I think. I can feel the cool winter breeze! Great skyline also! Bonne Année Jack, par-delà les océans ! John, I would draw the crop line on this photo so that the flag pole is right at the right hand side, and I would cut into the water so that it is a minor player - thus emphasizing the popping flag that you want the viewer to focus on. This would also let me eye focus into the great steamboat and windows of the building. Give it a try! the tones are beautiful ,jack ! A lovely shot. That's a cool old boat there. Very nice image, good composition, bravo! A good strong breeze then. Love the old riverboat. I think this if my favorite of the series, Jack. Love the boat. @B. Thomas: Thanks, Barb. Personally, I love the bridges. wow..a great scene, and great series..
Nice clear colors. I like it. Wow, this boat is still using paddles. Beautiful view on the city. A beautiful view of a cityscape. I think paddles ferry boats are great..looks like it has good years ahead too...lovely capture.lovely light in this shot.